I've always thought felines and canines did not interbreed, but this Panther kit has proven me wrong, as I have trouble not calling it a dog. 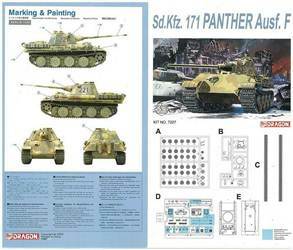 Readers familiar with previous previews of this kit and the related Ausf.G kit are probably not entirely surprised. As any good modeler, I always (?) look at the parts and manual before I start building the kit. Something that is noticeable straight away is the large number of "blued-out" parts on the parts diagram in the manual. These "blued-out" parts are the ones that are not meant to be used and are mainly parts for the Jagdpanther which are on the same sprue as some Panther/Jagdpanther parts. This means you will be left with mantlets, barrels and hatches (among others) from the Jagdpanther that you might use on other projects. Not "blued-out", but still left over after the build are a road-wheel of each type, tow cables and some sundry bits. Why Dragon molded 9 road-wheels of each type is anybody's guess. Some of the parts left over after construction. Modelers familiar with this kit know that this is one of the earliest Dragon releases with "conventional" (i.e. old school) vinyl tyres and metal hulls. The latter are notorious for their penchant to develop some kind of metal rot, which makes them disintegrate after some time. As I didn't fancy the idea of investing a lot of time in a kit that might have a short display-cabinet-life, and as the metal hull doesn't really allow for any real tweaking anyway, I opted to build the kit mostly out-of-the-box and did away with any measurements against scale drawings. Construction starts with the (plastic) turret, which seems good at first sight. "At first sight", because - as stated earlier - I didn't bother to measure the thing. Slightly straying from my OOB plans, I added a handle (made from sprue) to the rear hatch, which already has the holes to mount that handle to. The back of the frontal vision holes was blocked with a blob of black paint to avoid a see-through effect. I also drilled small holes in the bulges housing the telemeter. The end of the barrel is hollow, which is nice. What is not so nice is that one of the periscope covers is open on the wrong side, facing inwards instead of outwards. Someone was smoking some rather heavy stuff when designing this kit. The turret can be installed without glue, as with most plastic kits, but due to the loose fit it kinda "floats" if you don't glue it down. I could have replaced the lifting hooks on the turret, but shied away from it in the end. Next come the main parts of the hull, which are metal, roughly cast, and ill-fitting. Copious amounts of superglue were sacrificed in the process of mating them, even though the metal screws were tightened till I heard the metal scream in agony. A nice touch is the (plastic) engine deck with a rudimentary engine bay. Little will be seen through the gratings, unless one chooses to leave the main engine hatch open. This kit dates from the pre-PE days of Dragon, so don't expect any meshes for the engine deck. Detail on the plastic parts is rather soft, by the way. - The shovel is the (by now infamous) half-shovel. I left it off. - The fire extinguisher is a non-distinct blob of plastic. The painted model in the manual has a far better part. - The wooden jack block is bland, but can be improved with some scribing. - The starter crank has anything but a round cross-section. - The tow cables are mostly useless. Dragon provides extra tow-cable eyes, so you might build up your own using strands of copper wire or sowing thread. Later kits have metallic parts for that purpose. I have no idea how to add them to the hull, however, and the painted model does not show them either. - The spare tracks are rather poor, except on the side facing the hull and which will thus remain invisible. - The holes to attach all those parts to are of the "gaping hole" type. 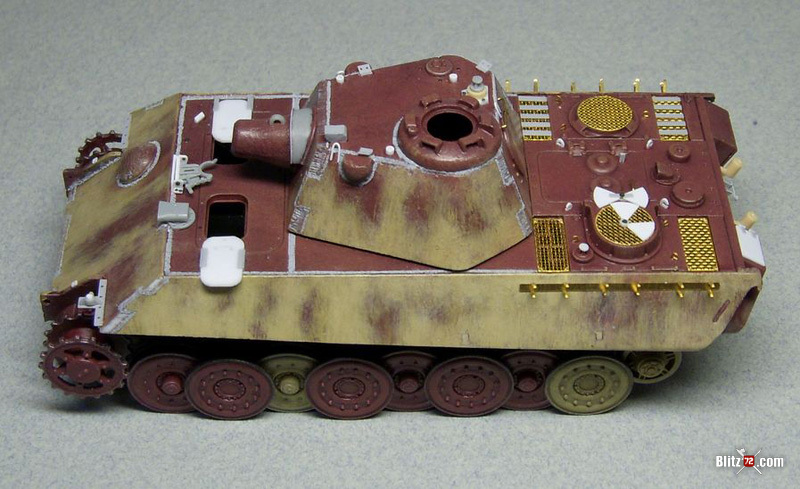 - the weld marks where the glacis meets the side of the hull are different between the Ausf. F and Ausf. G. In the Ausf. G (and the kit) they are perpendicular and parallel to the glacis; in the Ausf. F, they should be parallel to the glacis and parallel to the top plate. - the driver's hatches should be the sliding type, with rails on the side of the top plate, not bump stops for the pivoting hatches of the Ausf. G. The kit has neither bump stops or rails, but it has the incorrect hinges. - there should be a weld joint behind the plate over the driver's compartment. - the hull MG42 should be replaced iwth a St.G.44. A picture of a correct hull can be found here. Left: the "half-shovel"; right the "extinguisher-blob". 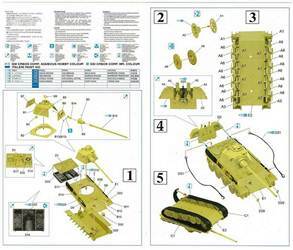 As almost all of the parts above are shared with other Panther (and Jagdpanther kits) by Dragon, you can say we are in a pickle. 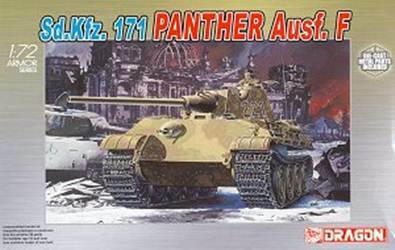 Rumor has it, though, that the latest Panther Ausf.D kit from Dragon has nothing in common with these early ventures. The running gear looks rather good, but when giving the painted road-wheels a light wash with diluted oil-paint some of the wheels split radially. Plastic fatigue ? The tracks are of the old black vinyl type, but are for the rest identical to the creamy DS tracks of later Panther kits. They are well detailed, but even with the best of my efforts too short for the job. I could go on rambling about some other minor shortcomings of the kit, but I believe I have made myself clear by now. The kit is not a complete disaster, assuming it won't disintegrate in a couple of months, but it is typical of a new brand's first efforts, as it was at the time of this release. I am pretty sure the newer Panther kits from Dragon will be infinitely better (and more expensive). I didn't try the kit decals, as I decided to go for a "what-if" paint-job. The figure in the picture is from Milicast set n°5 (yet to painted), the stars are spray-painted using Stencilit and the decals are from Peddinghaus. In the picture aboven the tracks still need to be integrated with the dio I am preparing (which will help hide the gap). I added "chicken wire" to the front glacis to hide the ill-fitting hull. Foliage still needs to be added; dried plants will beu sed for this. - a tree from a toy set, enhanced with newly scuplted bark and extra leaves from a bag of green "ground cover" from the railroad modeling shop. - a cemetary vault from Garage Exclusive Models set R72007.